is one of London's oddest streets. It runs for about a mile, almost due north, between Hampstead Heath and East Finchley. The land to either side used to belong to the Bishop of London, hence the name. Although the road is medieval in origin, the houses to either side look anything but. It's easily one of the most prestigious addresses in London, known by the mega-rich worldwide. And yet along much of its length its actually a bit of a dump. If you ever have oodles of cash to splash, you could do much better than pick The Bishops Avenue. At its northern end the street looks almost normal. That's normal like your average gated detached villa, whereas what's coming up later enters extreme enormous mansion territory. More peculiarly, after only a few hundred yards the avenue is crossed by a wide busy road, and not just any road, this is the A1, so living around here is never going to be quiet. Indeed while you might have expected a thoroughfare for the super-rich to be secluded and private, The Bishops Avenue is actually a bit of a rat run, and even has a bus route running down it. Admittedly that's the H3, which is one of TfL's least frequent minibuses, but then nobody who lives here would ever stoop to catching the bus anyway. Maybe the staff. The further south you go, the larger, the weirder and the more widely-spaced the houses along The Bishops Avenue become. Home buyers often weren't satisfied with the pile they'd bought and knocked up something even more outlandish in its place, indeed it looks as if every home was designed by a completely different architect. Some homes look classical, others almost Egyptian, and several like a 1930s town hall. At least a couple have a green copper roof, many have columns, and most have a large drive for the parking of several cars (be they for residents or socialite visitors). 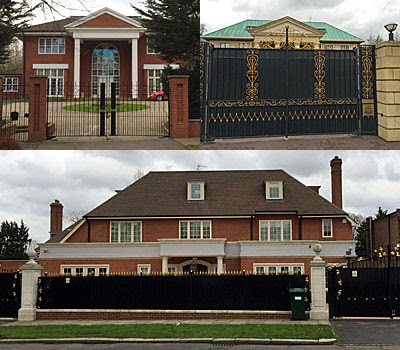 But don't expect to see the Sultan of Brunei here very often, nor the Saudi royal family at all - they sold up their ten mansions and moved out several years ago. 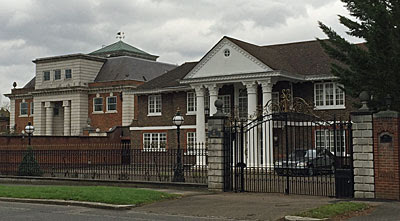 Where houses are occupied, the owners have often gone to considerable lengths to screen their frontages from public view. High hedges track the edge of the pavement, augmented by iron fencing, and thick leylandii are much in evidence to blot the neighbours from view. Often the only way to see what a house looks like is to peer through a narrow gap in a metal gate, not that this is recommended because there's usually a security camera keeping watch too. A few homes are set back far enough from the road to provide seclusion, but most are close enough to be seen more clearly from across the street, and some are brazen in showing their ostentatious face to the world. 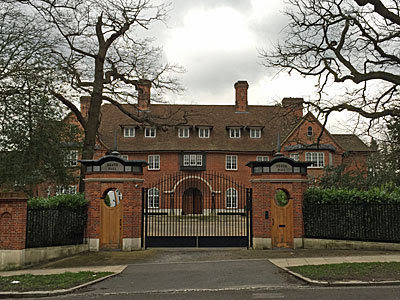 Houses on The Bishops Avenue cost millions, indeed they cost over a million pounds even back in the 1980s, long before the rest of London caught up. The most expensive house ever to grace the UK property market is here, that's Heath Hall, which was put up for sale for £100m a couple of years back. Built in the Arts and Crafts style for sugar magnate William Lyle, this Edwardian mansion boasts six reception rooms, 14 bedrooms, and has swimming pools both inside and out. Its most recent sale followed a period of decay and a substantial makeover, indeed you can still flick through the developer's brochure here, although unfortunately for them it sold for nearer £25m. Or there's Dryades halfway down, which looks like a 1980s Barratt home gone rogue, and whose most recent owner was a Pakistani government minister. But he fell from grace in 2013 and the bank repossessed, and the house's empty shell is still up for sale even three years later. The plot now has planning permission for an even larger mansion, a 46000 square-footer, but as yet nobody's taken the opportunity to create a 21 bedroom hideaway from scratch. 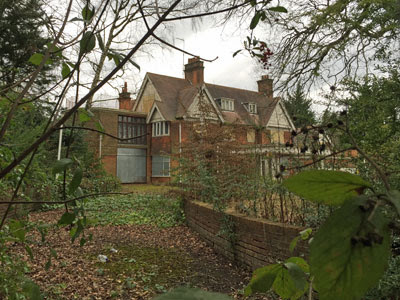 Again the pricetag won't have helped, not many of us have £30m to spare, hence the view through the gate is of an increasingly overgrown front drive and an entirely wasted asset. It's been estimated that at least a dozen properties in The Bishops Avenue lie vacant, that's a fifth of the total, indeed a sense of decay pervades the whole street. Billionaires have found better places in London to sink their fortune, with a central Zone 1 penthouse now deemed rather more attractive. You'll not see too many boarded-up mega-villas, but look out for the padlocked gates bedecked with security patrol notices, and lifeless windows behind which nothing ever moves. Four adjacent empty houses in the centre of the avenue have been lumped together under the title The Collection, with a pricetag of £35m, again with the assumption that something new will take their place. On such a linear site that'll likely be luxury flats, a property type making increasing inroads at the Hampstead Heath end, and whose density probably ensures an even greater return on initial investment. Despite the wealth still deeply entrenched here, I never felt uncomfortable walking down The Bishops Avenue, not even when whipping out my camera for a set of souvenir photos. But it is without doubt the least average street in the London borough of Barnet, if you ever fancy a peek at how the other 0.001% live.